Wow, Siri is pretty awesome. I've probably opened the alarm/timer app for the last time. Just say "Set a timer for 15 minutes" and that's it. There may be more and more apps I don't open too. Apple was smart to give it a personality, and answer all the geeky questions. That make it fun to play with, and I'm sure they use it all to help improve the voice recognition too. I assume they're doing the next thing: getting statistics about they types of things people ask about and where Siri doesn't have the answer. Recipes? Movies? Travel? Then partner with someone to provide the answer rather than having to send it as a search off to Google. That's one less thing Google gets to show ads for, which has to be pretty huge for Apple. And that's a very valuable customer recommendation, companies may pay huge money or give a commission for the privilege to being Siri's answer. If all movie questions got sent to Fandango, or all travel requests went to Expedia, wouldn't they give Apple something for that? If I were them I would give a LOT for that. Yeah, Apple was right. Duh. As pointed out here and here and other places, 3.5" screen is just the right size for a normal adult to comfortably hold and use the iPhone in one hand. Thinking about it as I use it, I'm able to touch the farthest points just at the point before it would be uncomfortable. Even another 1/4 inch away for the farthest corner gets pretty uncomfortable. Before the first iPhone came out, there were zero points of reference, and they could have made the screen any size or shape they wanted. I'm sure there were lots of prototypes. At another company, you'd expect there were committee meetings and focus groups, but I'd bet at Apple, Steve Jobs just handled them all and picked the one because that's what fit his hands. And the 3.5" size was THE size that was as big as possible while still being usable one handed. And that's the one and only size the rest of the world ever saw. People have been wondering who might be the next Steve Jobs. Looking backward, at who the last Steve Jobs' were, the common names I've seen include Disney, Ford, Einstein, Edison. A few names spread out over a long period of history. A few industries are lucky to get one, but so far no industry getting two. All at the beginning, bringing their industry forward further and faster than it would have come without them. The next Steve is more likely a 10 year old boy or girl than someone working today. And they'll bring us nanotechnology or something we can't even guess. I bought my own Apple ][gs before leaving for college and that was the last Apple computer for a long time. After nearly 20 years on the Windows side, I'm mostly back to the Apple side. It's sad enough when someone who did so many amazing things passes away, but it's far sadder when it's way too soon, right in the middle of some of their best work ever. There are few I can think of to compare, and they're all known as much as artists as CEOs too: Walt Disney, Jim Henson, John Lennon. You might not be a fan of their particular work, but you can't deny they changed the world around them. 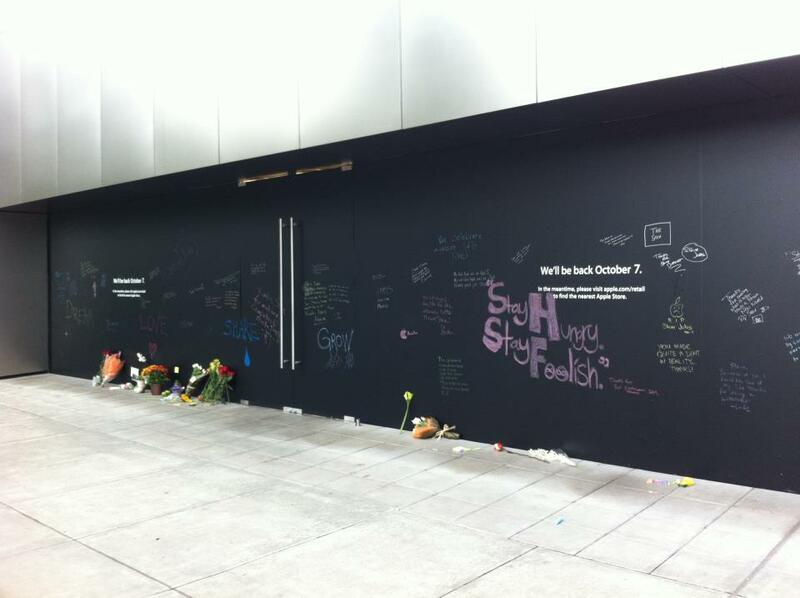 I wasn't the only one who left flowers outside the local Apple store. 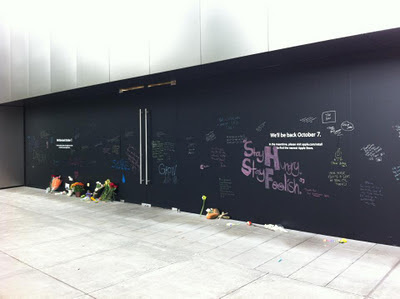 The one close to my house at University Village was closed for some remodeling, leaving a flat black canvas where people wrote with chalk or left flowers. My picture, taken with an iPhone of course, turned out pretty striking. Well, I wasn't quite right, it was a mix of my guesses (and keeping around the 3GS). It's odd the some "analysts" are disappointed. It is everything people hoped for in the next iPhone, with the exception of a bigger screen, a different shape, and the number 5 in the name. Now I wonder if they go back to a Summer release for the iPhone, or if it's now going to be coming in the fall. It makes sense to announce the newest iOS version at the big WWDC conference, then give the summer for developers to work and do stuff with it, and release the next iPhone that uses it in the fall. Judging by the iPhone, I'd guess the iPad 3 that it will be shaped exactly the same as the current one. Retina on the iPad will be the big (huge) selling point, so they won't need to update the styling to sell it.